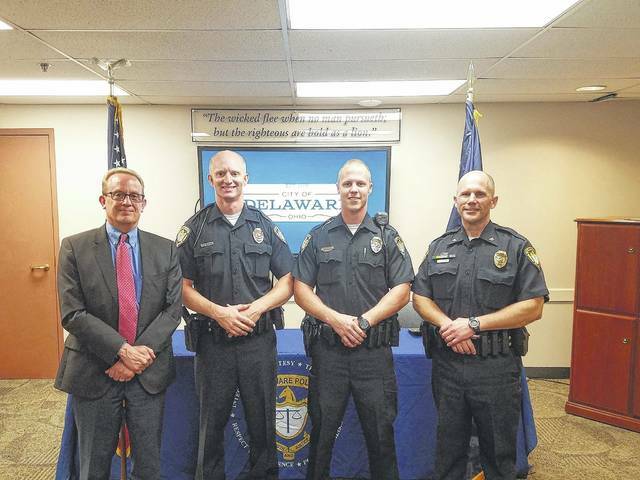 New police officers Travis Elkins, center left, and Bob Brown, center right, pose with Delaware City Manager Tom Homan, left, and Delaware Police Chief Bruce Pijanowski, right, after being sword in by Homan in July. Two new officers have joined the ranks at the City of Delaware Police Department. Travis Elkins and Bob Brown were recently sworn in as police officers for the city of Delaware and said on Friday that they were excited to serve the community. Elkins said he has been a police officer for nine years and previously worked for the police department of Huntington, West Virginia. Elkins said he wanted to relocate his family to central Ohio and found the Delaware Police Department during his research. City of Delaware Police Capt. Adam Moore said that Elkins will also be doing some on-the-job training because West Virginia peace officer certifications are different than Ohio’s. “I’m looking forward to getting to know the community better,” Elkins said. Elkins said he is very involved in outdoors activities like boating and hiking in his spare time. Brown is a Delaware County native and graduated from Buckeye Valley High School. Brown said part of the reason he wanted to work for Delaware was that his father was a deputy with the Delaware County Sheriff’s Office. Moore reported that Brown completed his peace officer training in July and was hired on afterward. Brown said in his free time he enjoys working on vintage cars. This entry was tagged city of delaware police department. Bookmark the permalink.